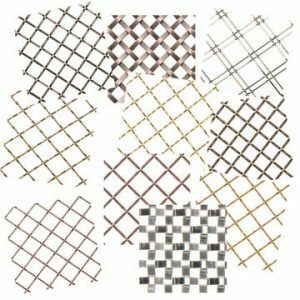 One of the most popular items sold by Van Dyke’s Restorers and the hottest product in home renovation is decorative wire grilles. It is also one of the first products that peaked my interest when I first came to work at Van Dyke’s. These unique panels of woven wire can make a dramatic difference in the look of a space. 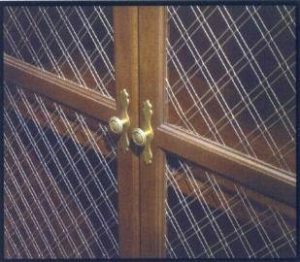 Decorative wire grilles (woven mesh grilles) are manufactured from various gauges of steel wires that are custom crimped and woven to create unique designs. They are commonly used to accent furniture and cabinetry and to make them stand out from the ordinary. 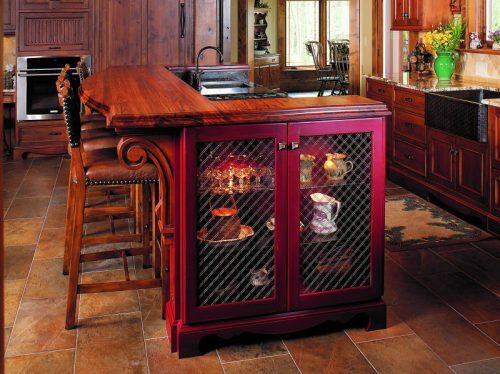 They are used in cabinets, hutches, armoires, bookcases, entertainment centers, wine cellars, vanities, and pantry doors. These versatile grilles can also be used as art. 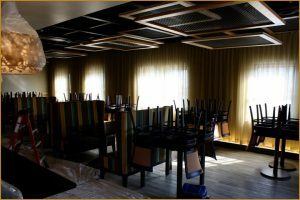 This photograph from our manufacturer shows several grilles that were framed and hung from the ceiling in a stacked arrangement at a trendy restaurant. Very cool and artistic! Not only are wire grilles visually pleasing, they are also allow air to flow for breathability. This is particularly useful in entertainment centers to prevent overheating of electronic equipment. Van Dyke’s offers over 70 different wire grilles in many designs and metal finishes. 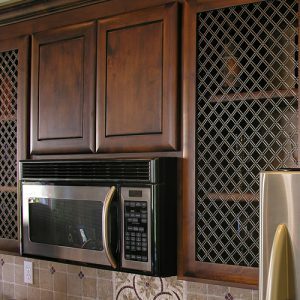 With so many styles of decorative grilles, it’s easy to add a unique and distinguishing look to your home. 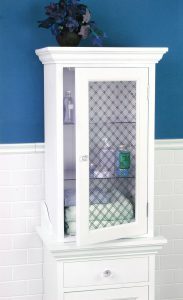 Adding wire grilles to cabinet doors is a great DIY project (See our instructions below). Replacing some of the solid door fronts with wire grilles creates a beautiful change of texture and breaks up a continuous cabinet arrangement. 1. Remove the cabinet door and place face up on your work bench. 2. Drill a 3/4-inch-hole 1/4-inch from the edges of the rail and stile in one corner to allow access for the jig saw bit. If working on a flat surface, determine the area you are desiring to cut out and draw the pattern on the cabinet. 3. Insert the jigsaw bit through the hole that you drilled in Step 2 and carefully saw along the edges of the rails or lines you drew. 4. Remove the piece you just cut out and sand the cut edges until they are completely smooth. When smooth, turn the cabinet door over so that the back side is now facing up. 5. Using a router, route a 1/4-inch wide by 1/4-inch deep groove around the inside edge of the cabinet door frame. 6. Sand the routed groove with a sanding block or sand paper until it is completely smooth. 7. Trim the wire grille panel. Use wire cutters, tin snips, or metal cutting blade in your power saw to trim the wire grille to size. If using a power saw, clap a guide in place for easier cutting. 8. 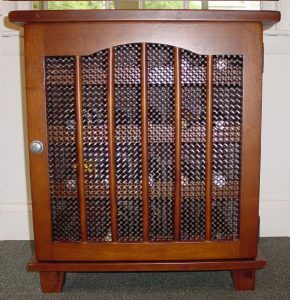 Insert the decorative wire grille into the routed space in the back of the cabinet door. 9. Screw the wire grille into place or secure it with thin molding strips or tabs.